At 68 years old (69 later this year), Bobby Knight needs 98 more wins to get to 1,000, but more importantly, he needs a job. Even then, he would probably need at least 5 years to get there. Mike Kryzewski is probably the name most mentioned as having a chance to get to 1,000. At 62 years old, he currently has 827 wins. Throughout his 33 year career, he has averaged 24 wins a year, so at that pace, he would need 7+ years to get there. Unless his health were to suffer significantly, it is probably a safe bet that Coach K will coach until he is at least 70 and hit 1,000 wins sometime in 2016 or early 2017. Rounding out the old guys group is the UCONN guy, the Syracuse guy, and the Maryland guy. Jim Calhoun is 66 (soon to be 67 ) and needs 200 wins to get there. He at his current pace he would need about 9 Â½ years to get there. With the powerhouse that UCONN is now, lets be optimistic and say he could do it in 8. 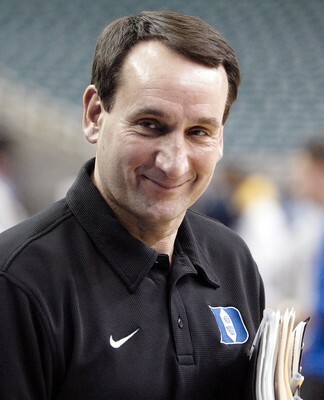 That would make him 75, and most likely still behind Coach K. Jim Boeheim is 64 (soon to be 65) and is at 791 wins. He has averaged 24 wins a year, so he would also need 8-9 years to get there. That puts him at 74, and also, still well behind Kryzewski. Gary Williams is 63 (and will be 64 on Wednesday), and is sitting at 621 wins. Given the unrest about his job security, his age, and what seems like a likely trip to another school that needs some rebuilding, my guess is that Williams tops out around 820 or so. To get to 1,000 at his current pace, he would need 18 years. Given how Williams handles stress, anyone wanna bet he is still coaching at 82? Bob Huggins is at 636 wins and is only 55 years old. He has averaged just under 24 wins a year, and assuming good health (which is not a sure thing with his crazy lifestyle), he would need 15 more years to get there, which would also put him at 70. My guess is he never gets there because for the most part, one DWI usually leads to another, and my suspicion that this guy is a recruiting violation timebomb. Larry Eustachy II anyone? Bo Ryan, at 574 wins and 61 years old. He would need 19 more years; more importantly though, Bo Ryan has been coaching somewhere in Wisconsin since 1976. At this point his veins are probably filled with a mixture of melted cheese, sausage, and other miscellaneous dairy products. If the over/under on his life was 80 years, I am betting the house on the under. Roy Williams 58 years old with 585 wins and the job at UNC for the remainder of his life. He has averaged 27 wins a year and would need 15 more years to get to 1,000 at that pace. My money says he gets there and demands they rename the gym after him when he does. Rick Pitino is 56 years old, and sitting at 544 wins. He would need 19+ years at his career average of just under 24 wins a year to get there. He would have had a much greater chance to get there had he not spent eight years of his life trying to prove he could coach in the NBA. Had he not engaged in his ego driven flight of fancy, he could be right around 700 wins now and be in the driverâ€™s seat to hold the all time record. Pitino feels like the kind of guy that really cares about records and will coach forever, so I am guessing he puts in those twenty years and gets to 1,000. See, and you were expecting an obvious â€œheâ€™s not walking through that doorâ€ joke. Well, I am full of surprises. Mike Montgomery (56 years old and 568 wins), Rick Barnes (54 and 449 wins) just donâ€™t seem like guys that are gonna get there. Montgomery needs 20 years, and although he is ahead of Pitino, I am guessing he retires relatively young and disappears from the radar. Tom Izzo is 54 and sitting at 328 wins, so he has no shot. The guy in this group that does have an outside chance is John Calipari. He has 434 wins and has averaged 27 wins a year, and would need another 20 years to get there if he can keep it up. Like Pitino, he would be much further ahead if he hadnâ€™t wasted 4 years in the NBA. Bill Self is 46 years old and sitting at 349 wins. He would have to coach another 28 years at his current pace to get there. That is an awfully long time, but he is at a school that wins a ton of games and tends to keep coaches for long tenures. I would say he has a 10% chance to get there. Bruce Pearl is 48 years old and currently has 412 wins. He has won an astonishing 24.6 games a year, so he would need another 23 years to get there. Tennessee loves this guy, and he loves Tennessee. He seems like the type of guy that is going to have to be dragged off the sideline. I am rooting for this guy to get there, if only so Tennessee could present him with a pearl necklace as a congratulatory gift. Thad Matta only has 225 career wins, but he is still only 41, and is averaging just a tick under 26 wins a year. If he were able to keep up that insane pace, which is not likely, he would need about 30 more years to get there, which is highly unlikely, but not impossible. In the words of the immortal Lloyd Christmas â€œSo youâ€™re sayin thereâ€™s a chance! Will Brown, head coach at Albany, has 195 wins in 7+ years and is only 37. Methinks he wonâ€™t be coaching in Albany for too many more years, unless of course he loves the snow and freezing cold. He wonâ€™t be there more than a year or two more. (but he would need to stay in the business for 30 more years to get to 1,000). Scott Sutton, the head coach at Oral Roberts has 168 wins and is also 37 years old. Rounding out our group are Chris Lowery, from Southern Illinois (109 wins 34 years old), and Jeff Capel (143 wins at VCU and Oklahoma at the tender age of 34). Capel is the intriguing member of this group because he is already at a big school in a big conference. He has only averaged 20 wins a year, so he would still need another 40 years coaching to get to 1,000. However, he would still need to have the court at Oklahoma named after him to ever have a chance. So in the end, who do I think will get there? Mike Kryzewski is almost a lock, Roy Williams and Rick Pitino figure to hang on long enough to get there as well. I think John Calipari probably ends up limping over the line, and for the pure joy of it, I say Bruce Pearl gets there too. So yes, I am predicting that five guys will join a club that currently has no male members. If this was baseball, everyone would accuse them of being on steroids. As funny as it is to give Bruce a necklace, his actions as an assistant at Univ Iowa are unforgivable. And for that, i hope he doesn’t get 1,000 wins.